The third and final day of Event 36, $3,000 No Limit Hold’em Shootout, of the World Series of Poker has come to and end. After a final table of ten players resumed play this afternoon only Craig McCorkell remained to claim the WSOP gold bracelet and $368,593. The ten returning players had to win two tables to make the final table. The first round saw a full ring table and Day 2 had six-handed action. McCorkell won his first bracelet and had to battle Jeremiah Fitzpatrick heads up to claim it. The first elimination from the ten-handed final table was Sardor Gaziev. He went to a flop three-handed with Alessandro Longobardi and Jonathan Lane. The flop saw Gaziev bet 62,000, Longobardi folded and Lane raised to 125,000. Gaziev shoved and Lane snap-called holding trip fives. Gaziev’ pocket tens never improved and he was sent to the rail. The ninth place elimination came 20 minutes later when Joe Tehan opened, Jonathan Lane three-bet and Tehan four-bet shoved. Lane called with pocket jacks and Tehan held . The board ran and Tehan was eliminated and Lane took a serious chip lead over the table after his second knockout hand. Thiago Nishijima didn’t lose a major pot while he was at the table, instead he bled chips for almost four levels. Lane opened for 50,000 and Nishijima moved all in. Lane called with pocket jacks and Nishijima held . The board ran and Nishijima was sent to the rail. Another hour would pass before we saw our next elimination. Lane opened to 55,000, Craig McCorkell and Alessandro Romanello called from the blinds. The flop came and after two checks Lane bet 100,000. McCorkell folded and Romanello shoved. Lane called, tabled pocket tens and Romanello held . The board bricked for Romanello and he was eliminated. Another 30 minutes passed before Antonio Esfandiari opened for 65,000, Longobardi shipped on the button and Lane re-shipped over the top. Esfandiari folded and the hands were tabled. Lane had and Longobardi was in trouble with . The board ran ten high with only one diamond and Longobardi was eliminated. Just two hands later Athanasios Polychronopoulos got all in preflop against Esfandiari. Polychronopoulos had and Esfandiari had pocket jacks. The board ran and Polychronopoulos was eliminated. We would return from the dinner break before the next elimination would come. Lane got his money after to flop of and Esfandiari called. Lane was all but dead with Esfandiari flopping the nut straight holding and Lane holding the low end with . 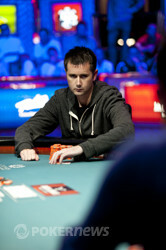 Lane exited the final table in fourth place. During most of three-handed play Esfandiari held a dominant chip lead. At one point he held 75% of the chips in play and seemed to be in cruise control en route to his second WSOP gold bracelet. But fate is cruel sometimes. Esfandiari first doubled up McCorkell and then lost a big chunk of his stack when he called Jeremiah Fitzpatrick’s all in shove with pocket sevens holding pocket nines. Fitzpatrick flopped a seven and left Esfandiari with just over one million chips. Then he called another McCorkell all in when he held and McCorkell held . The board ran and Esfandiari was suddenly the short stack. A shocked Esfandiari moved all in the next hand holding and McCorkell called with . 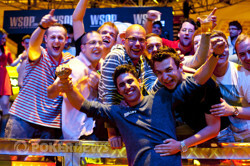 The board ran and Esfandiari was eliminated in third place. The heads up battle between McCorkell and Fitzpatrick started with Fitzpatrick holding 3-1 chip lead. McCorkell worked his way up to even and then closed it out in just a few key hands. Fitzpatrick had picked up some momentum before it came crashing to a halt. McCorkell three-bet and Fitzpatrick four-bet jammed and McCorkell called with pocket eights. Fitzpatrick held and never connected with the flop. The hand left Fitzpatrick with just 45,000 chips with the blinds at 30,000/60,000. Fitzpatrick doubled up on the next hand, being forced all in and then shoved blind all in on the next hand. McCorkell called holding and Fitzpatrick held . The board ran and McCorkell locked up his first WSOP gold bracelet. Craig McCorkle makes an improbable comeback to claim the WSOP Gold Bracelet in Event 36. He defeats Antonio Esfandiari and Jeremiah Fiztpatrick in three-handed action. After being defeated in the previous hand, Jeremiah Fitzpatrick was forced all in in the dark. Fitzpatrick picked up against Craig McCorkell's . McCorkell took the lead on the by pairing his ten, but Fitzpatrick was able to jump ahead when the turned. Fitzpatrick ensured the double up on the river. Fitzpatrick moved all in blind again the next hand and was called by McCorkell. McCorkell had Fitzpatrick crushed and kept it that way on the . McCorkell's victory was ensured when the turned. The completed the board but by that time McCorkell was being lauded by his rail with cheers and celebratory chants. Fitzpatrick, on the other hand, will take home $228,261 for his second place finish. Jeremiah Fitzpatrick opened and Craig McCorkell raised to 350,000. Fitzpatrick moved all in and McCorkell called. The board ran and Fitzgerald was left with just 45,000 after the stacks were counted. Jeremiah Fitzpatrick has picked up two decent pots in a row. In the first hand, both players limped and the flop came . McCorkell bet 70,00 and Fitzpatrick called. Both players checked the turn. The river brought the , McCorkell bet 145,000 and Fitzgerald raised to 425,000. McCorkell folded. The second hand saw McCorkell open on the button to 120,000 and Fitzpatrick called. The flop came and both players checked. The turn came , Fitzpatrick checked, McCorkell bet 70,000 and Fitzpatrick check-raised to 170,000. McCorkell folded. Craig McCorkell opened to 120,000 from the button and Jeremiah Fitzpatrick called. The flop was and Fitzpatrick checked to McCorkell who continued for 65,000. Fitzpatrick opted to check raise to 170,000 and McCorkell called. Fourth street brought the and Fitzpatrick continued the aggression by betting 250,000. Once again, however, McCorkell called. Fitzpatrick eased up when the dropped down on the river, allowing McCorkell to bet 390,000. Fitzpatrick folded and McCorkell dragged the pot and slid into the chip lead. Jeremiah Fitzpatrick opened on the button for 150,000. Craig McCorkell re-raised to 385,000 and Fitzpatrick sat motionless. Some of the crowd rose to their feet but then Fitzpatrick folded. The two competitors have played a few hands and they've kept it small.